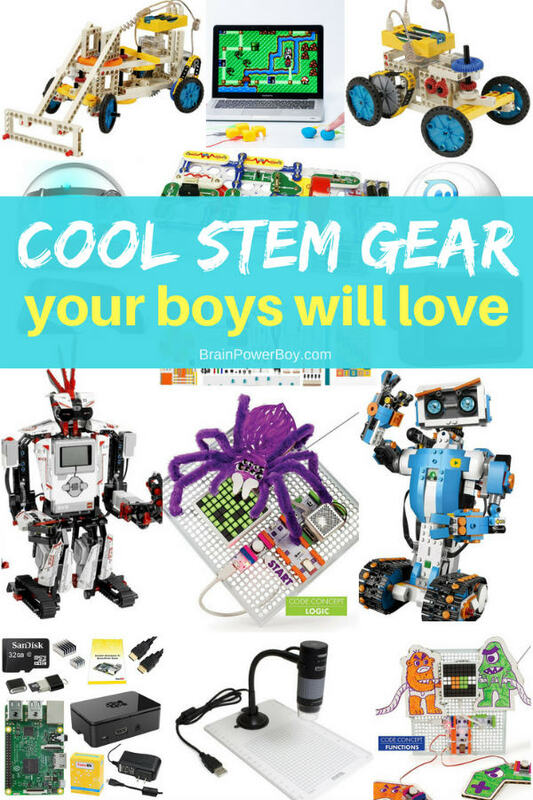 If you are looking to add some cool STEM (science, technology, engineering and match) gear to your after school or homeschool collection, you have got to see these. We rounded up some very neat technology-based STEM learning items that you totally have to check out. This awesome gear will make him dive in to something new and he will expand his horizons and maybe even find a new hobby. These are really great for gifts but also to surprise him with something new! You can also take a peak at our gift guide for boys page for more ideas. To take LEGO up a notch try LEGO Mindstorms EV3 for programming and robototics. This is one great “toy” with a community of enthusiastic people trying new and exciting things, and sharing what they are doing so your boy can do it too. Worth the money. If your boy is not yet ready for LEGO Mindstorms, then try LEGO Boost! It is wonderful for around up to 12-years-old and involved building and simple coding. Fitbit Flex Wireless Activity Wristband is a tool for activity and sleep tracking Have your boy use it to track activity and try to beat his records and to create charts and graphs – throwing in a little practical and useful math is always a good idea. Pair it with apps to do even more. Heath, and fitness. Does your boy like fiddling about with electronics? Order this Raspberry Pi kit (Raspberry Pi 3 Complete Starter Kit with WiFi ) and he will be thanking you again and again. Once you have this kit there are a lot of different projects you can do. Here are a few examples. If he is not fond of Pi – you could try The Arduino Starter Kit .This kit has everything you need to do a lot of projects and includes a 170 page project booklet. Electronics. See this article for info on deciding which platform is best for your boy. Let him read the article and look at the different projects to decide which he would like to try. We have the Snap Circuits SC-300 Electronics Discovery Kit . It is much more reasonably priced. We really enjoy this set and get it out every once and a while to play around with the projects and try to build our own. This electronics set has over 60 pieces and you can build a radio, a doorbell, use switches etc. There are a lot of projects and tweaks to the projects featured. Have you seen Ozobot ? This little (and it is indeed little) robot is so neat. What I really like about this choice is that while it comes with an app it also is hands-on. Ozobot follows colors on either a tablet or a piece of paper. You can code him by using different color combinations. Probably best for someone starting out. Watch the video below for more details. Coding, robotics. The other cool coding ball is Sphero. It is also app controlled and a whole lot of fun to play around with. This is a neat little invention from which boys can make their own neat little inventions – gotta love that! Makey Makey turns about anything into a keypad. I would try to explain but you are really better off clicking through and watching the video located on the left hand side of the page. Inventions, and engineering. Build your own remote control vehicles. I don’t know about your boy, but mine really enjoys remote control vehicles. With this Remote Control Machines set you can build up to 10 different models that move. Be sure to suggest he use his imagination to build many more. Building, motors, and mechanical engineering. The Plugable Handheld Digital Microscope plugs right into a USB 2.0 port and provides 10x – 250x magnification. If your boy likes science this is an inexpensive tool that he will enjoy using. Click through the link and take a look at the second video under reviews to see the possibilities. It does a great job for a starter digital microscope for kids. Bonus – it takes pictures. Science. Last year I got my son a tablet and it has been a wonderful tool for him to use. Stick with a sure thing and go for the iPad . Apple has a lot more educational games than Android does, by far. We often see games we would like to try but they are only available for Apple devices. All the subjects! This is a seriously cool way to add some technology to your home – your whole family will love it. Have you heard about Echo Show ? I am very keen on trying this as a tool in our homeschool. You can ask it questions so if you are working on a project you don’t have to stop to go to the computer and look things up. You can also ask for help spelling a word or getting a word definition. Plus it plays music, checks the weather and so on just like the Echo does but this one has a screen and can also show you things. It is giving me flashbacks of watching The Jetsons cartoon lol. All the subjects. When deciding what you are going to purchase . . .
Look at the types of things you would like to see him learn in the future. Do that and you will have a great selection of things for you and your boy(s) to use throughout the coming years. Check out our Homeschool Science Equipment: The Essential Tools if you are looking for more wonderful things to add to your homeschool and The Very Best Hands-on STEM Toys to Engage Boys for more cool ideas! I think when we homeschool – especially if we do it year round – we can forget about the buzz of back to school and the newness of the items that traditionally go with it. Thanks for the reminder! I am positively drooling over this list by the way! My brother got a Go Pro for Christmas and we “not quite teenagers anymore – by a long shot” had great fun putting it through it’s paces. I don’t know where to start – I want one of everything! All kidding aside, this is a wonderful resource Sheila. There is so much more to technology than tablets and mine craft, and I love how you highlighted that. I didn’t know LEGO had tech based stuff, so I can’t wait to check that out. Robot creation is pretty popular in our home right now. Though we don’t homeschool, I do try to plan enrichment activites for at home, that are tailored to the boys interests. I called it fostering hobbies, because so often now kids aren’t encourage to have hobbies. Play sports, read more, have less screen time sure, but hobbies never get talked about. I can’t wait to sit down with the boys and go through this post with them. I think both our teen and youngest will find something here that peaks their interest. LOL, well Alli that is sort of how I felt. There are certainly some fun things out there and you are very right that there is a lot out there that includes some hands-on activities and learning in addition to the neat stuff on screens. I had no idea there was another level to Lego! My son is so engrossed in the world of Lego I forget to look into the future when he may grow out of the learning stage he is in. And the microscope is going to be a huge hit too. Some of this wonderful tech gear can be pretty expensive. Thanks for a list so I can start a little savings fund! Oh yes Marie, There is a whole lot more than what I posted here. Good idea for a savings fund. I have found that all of these items are worth the cost if you son is really into that type of thing. Following their passions is what is key. I see some things I haven’t heard of before and I’m sure my teen would like some of these. Thanks for sharing your list on Merry Monday.